Gorham High School Principal Brian Jandreau, left, School Resource Officer Wayne Drown and social worker Claudine Emerson are members of a student services team that focuses on relationships to proactively reduce chances of violence. 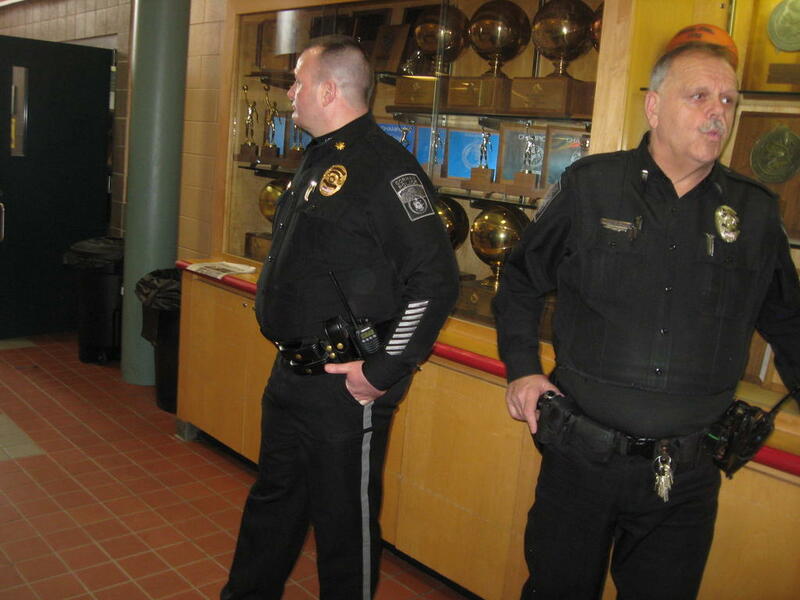 SRO Wayne Drown, right, keeps a close eye on Gorham High School. Drown is pictured with Gorham Deputy Police Chief Christopher Sanborn on March 15, the student walkout day. GORHAM — The 17 victims recently gunned down in a Florida high school has fostered renewed attention to mental health issues as worries grow among students, parents and high school staffs nationally. At Gorham High School, officials have taken a proactive approach to thwart violence by creating a team to deal with problems, increasing the budget for counselors, and emphasizing the importance of relationships with students. A school student support services team led by Principal Brian Jandreau meets regularly and its members are ever present in the school’s corridors. Besides Jandreau, Emerson, and Drown, the team members include assistant principals Ryan Watts and Christina Cifelli, other on-staff social workers, a nurse and school counselors. The high school has four school counselors (once known as guidance counselors), and three social workers with one designated for special education students. In a recent principal’s message posted on the school’s webpage, Jandreau said he hopes students with problems will seek help from support service team members. The team members meet regularly for an hour on Wednesdays to discuss and share information. Common student issues include acting up and self-isolation. Jandreau said the team focus has headed off a fight and interrupted those who might want to hurt themselves. Costs budgeted for school counselors at the high school has increased sharply in the past 11 years while student numbers have declined a bit. According to statistics compiled by Assistant Superintendent Christopher Record, the school district budgeted $169,936 for high school counselors in the fiscal year 2007 and that number for the present fiscal year 2018 has jumped up to $401,565. The high school in 2007 had nearly 900 students, according to an American Journal article in 2013, but the number has declined to a present enrollment of about 850. The district’s newest position is what it calls the “8-9th transition counselor.” Jandreau said. The position is important in meeting the needs of students and school safety. Emerson, who has been a Social Worker at Gorham High School for 15 years, said occasionally the duties of school counselors overlap with the roles of social workers. “But, school counselors frequently refer students with serious mental health issues to the social workers,” Emerson said. Emerson said the issues were once more about students paying attention in classes, but now issues include loneliness, withdrawal and anxiety. Students want a “sense of belonging,” she said. She said most are willing students and the number represents a 50/50 ratio in gender. “I try to tell students we’re here for them,” Emerson said. She sees perhaps 120 students during the school year and the three high school social workers who as a group likely meet with more than 200. “We have an open door policy,” Emerson said. In recent years, Emerson has spent considerably more time on the telephone with parents. Jandreau also invites parents to contact him. “I’ll echo that,” Officer Drown said. In some cases, Emerson recommends outside therapy. She said there are counselors available in Gorham within walking distance, but the town isn’t served yet by Metro bus service. For therapy, sliding pay scales, she said, are a possibility to make it affordable for families. “I can’t mandate it, but I can highly recommend it,” Emerson said about outside therapy. But Drown, a key member of the student support team, said judges can mandate therapy if the student is involved in a criminal case. He said a state juvenile corrections officer sometimes attends the support team meetings to offer advice as well. The support services team is “not soft on crime,” Drown said. Drown said 15 years ago problems were more behavioral in nature. “Now, it’s mental health,” Drown said. The veteran resource officer said police have heightened their presence at the high school with Gorham Police Chief Daniel Jones and other officers actually teaching some classes in the school. Beginning his daily routine, Drown arrives at the school about 7:15 a.m. and begins his day with “buzzing” around the parking lot in his police cruiser. He’s in the building the entire time students are present. The school day begins at 7:50 a.m. and lets out at 2 p.m.
Drown is popular among the students and wears more than just his police hat. “A teacher said we’re safer because of Pooch,” Jandreau said. “It’s relationships, relationships,” Drown said. Last year, a student went to a team member to report a bomb threat in the school. The threat proved a hoax but Jandreau said the support team reviewed the school’s crisis plan. To ramp up security, Drown recommended that the main office be relocated from the Morrill Avenue end of the building to the opposite end where buses discharge and pick up students. “This school needs to be flipped,” Drown said.